If you missed part one, here's the link: Mystery Monday: Did I Just Find One Of My Father's Cousins? In response to an increasing need for skilled medical and nursing care for mothers and children, The New York Foundling began providing health services in addition to social services, changing its name to The New York Foundling Hospital to more accurately reflect its services. While The Foundling provided medical treatment in addition to adoption and support services for mothers-in-need, it wasn’t until the 1930s that a Social Service department was established to assist those who could not properly care for their children. It appears that my aunt Hilda Dixon Kuylen was not able to take care of her son Leon and placed him in this agency's care. This makes sense. I know that she and her husband Hubert split up sometime later in 1940, according to the newspaper article on the kidnapping of their daughter Geraldine. Hilda was a "cafe society entertainer" who worked nights. Caring for a child would have been difficult to do on her own. The next thing I decided to do was Google "Leroy Kuylen." Nothing promising came up. Then I tried "Leon Kuylen." I think this may be my guy. Correct age. The name is unique. I haven't come across any other Leon Kuylens in all my searches and it is the correct year of birth ---1939. Perhaps I could find out a bit more. I go back to Google and plug in "Leon Kuylen" again and this time I narrow the search down by clicking on books. A result comes up. Some of them roll over and spring from a sit-down to stand up position." He noted that staff members are required to be on the trampoline with jumping residents except for a few who are "pretty good. "Leon Kuylen can do flips." Greg beamed. I say to myself.....What is this?!! This entry is from a book called "Mental Hygiene News", Volumes 48-49 - Page 10, New York State Department of Mental Hygiene., 1977. Only a portion of this text is view-able online. This is Google's explaination for why. For books that enter Google Books through the Library Project, what you see depends on the book's copyright status. We respect copyright law and the tremendous creative effort authors put into their work. If the book is in the public domain and therefore out of copyright, you can page through the entire book and even download it and read it offline. But if the book is under copyright, and the publisher or author is not part of the Partner Program, we only show basic information about the book, similar to a card catalog, and, in some cases, a few snippets — sentences of your search terms in context. Okay so this is when I play around with Google to see if I can see more of this snippet. It sounds like to me that this Leon had some sort of disability. I put in quotes the following: "Leon Kuylen"+"mental". This is what came up. Aha! Okay we are now talking about Rome, NY. Was Leon wheelchair-bound? I try Leon Kuylen again but now I type it in the box for searching inside the book and a little more information comes up. I begin reading in the middle column. According to Mr. Vickowski, the purpose of the program is to enable residents to feel movement, stimulation, and balance they never experienced before. He said the sessions were initiated because "We had a lot of overweight residents in Quincy Hall." His definition of a flip? "Standing up, doing a somersault and landing on his seat." Wow that sounds pretty cool to me. I don't think I could do that now if I tried. 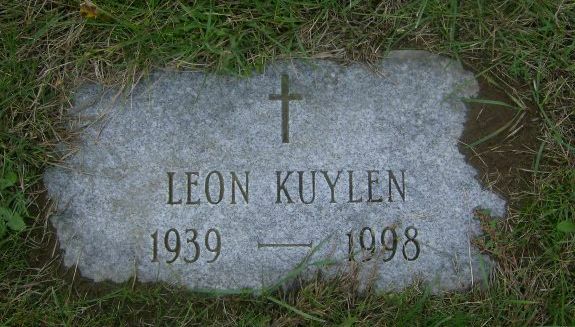 So this is where I leave off with Leon Kuylen. I have some leads and of course more digging to do. At least now, it feels like the story my father was told about his cousins wasn't a fairy tale. Geraldine and Leon Kuylen were real people. When I know more information, I will pass it on. Me too, Yvette. I have found so much good information about my ancestors this way. Sounds like you found the right guy for sure! Being a single mother is not easy without family support. Leon's mother likely do the best she could for him. I agree with you too Linda. I'm new to this blog, but when I read this post it was so intriguing that I had to go back and read the previous one. I admire (and wish I had) your skill in moving from one source to another--FindaGrave (just with a first-name change), Google books, Google, newspapers from ProQuest, the census, the Foundling Hospital. That's a lot of expertise. And you find Leon doing flips. What a story! I wonder if it's possible to find the author of that book . . . sounds like the book is under a lot of protections, though. I enjoyed reading your blog! Thanks for reading and your compliments. I am right now researching this a bit further to see if I can find any cemetery records about who buried him and where he lived. Wish me luck!